Best Ever Vegan Chilli was posted on August 31st, 2011 and is filed under Dairy Free, Gluten Free, Main Dishes, Protein, Recipes, Vegan, Vegetarian. This entry has 11 comments. You can follow any responses through the RSS 2.0 Comment Feed. This morning was all dark and moody with a light, but insistent rain pounding on my window. It’s still raining now…and I love it. These are my absolute favourite days…where it’s overcast and there’s a constant tap tap on the roof. It makes me want to just curl up with a quilt and draw, journal, or read with a cup of hot cocoa by my side. Fall is in the air. And today is the last day of August. That said, I wanted to share one of my favourite new recipes! It’s just the best way to start this new cozy autumn month off! I call it my “Best Evaaaa Vegan Chilli”! Maybe that’s a bit of an egotistical way of starting a post…but seriously, it’s the best chilli I’ve ever eaten. I couldn’t stop taste testing. Okay, I wasn’t taste testing…I was picking away with a lack of self-control. Give credit to the spices. Or something…anyway, it was good. This chilli is actually a completely balanced meal all by itself. It has the carbs, protein, fiber, veggies, and healthy fats that you need for a meal, actually more than enough. For once serving of this chilli you’re getting 21 grams of protein and almost 15g of fiber (a daily goal to shoot for with fiber is 25g). That being said, at dinner, I still served it up with some homemade, warm cornbread and a fresh salad from the garden with balsamic dressing. I soaked my beans overnight and cooked them up in the morning before I started on the chilli, but you can easily skip this step and used canned beans that are already cooked. It’s up to you. As for the tomatoes, I just thawed out some frozen tomatoes from last year’s harvest. *I used the oil-packed sundried tomatoes. To save on calories, you can pat off some of the oil with a paper towel or buy the dry sundried tomatoes (if you do the latter, you’ll need to soak these for a while so they’re soft). Start by placing the grapeseed (or olive) oil in a big cooking pot. Add the carrots, celery, and onions and cook for about 7 minutes or so until all the veggies are tender. Now add all the rest of the ingredients and cook until everything is piping hot. This serves 8. What are some of the cozy things you look forward to in the fall time? Do you like your chilli super spicy or mild? perfect! I have been looking for a vegetarian (vegan is a plus so hooray!) 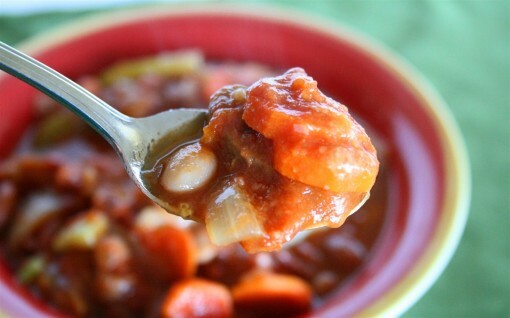 chili for fall/winter! I don’t usually like being out in the rain but if I can manage being inside, under a blanket with a good book then I love listening to it, too! Nice. I love vegan chili. Almost makes me excited for fall. Almost. I have NEVER been able to make good tasting chili. It’s always bland… I know, right?!?!?! I have even loaded the chili FULL of chili powder and nothing… Sigh. So I am going to swipe this recipe and make an attempt again when it gets cold. I can already feel the weather cooling down a bit. But it is perfect for chili — I love that you added the sundried tomatoes into this recipe. What great flavors. There is nothing better than chili on a rainy fall day!! I can’t wait to try this (although I may have to de-vegan it just by adding a little sour cream and cheese on top, but that’s just me being decadent). I just noticed that the heat has automatically turned on today… That means it has definitely gotten a lot chillier these last days! We actually had sunshine today but I do also love those dark, windy and rainy autumn days. Preferably though when I can stay home and when I don’t have any photoshoots planned (as the light is obviously horrible then!) Love your chili. Definitely something for autumn! I’m always looking for new vegetarian and vegan recipes to try, this looks wonderful! All those fine ingredients certainly make it a contender for a top tasting chili. The cumin and oregano.. oh and even some organic sugar. Good stuff! It’s great to make it all for one person and have it last you 4-5 days. I’m a student and it really helped me to make this and not have to worry about cooking on days that I have class.